Design Addict Mom: Antlers Mania. 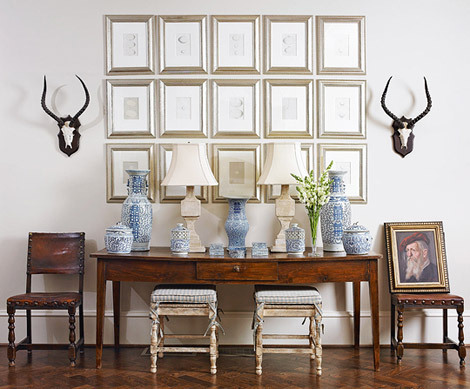 I was recently perusing some of my Elle Décor mags dating as far back as 2006 and antlers were quite populated the walls of quite a number of the interiors that they featured then. When I went to High Point Market, there were antlers everywhere! Dare I say antlers are here to stay! The one featured above can be found in this etsy shop. I hadn'tthought of incorporating antlers before, but they make for unexpected and fun decor! I definitely have antler fever, though I don't own any. I am on the hunt for the right pair in the right place. I know I'll find them....so happy it's a trend that's here to stay!! Hey lady. Ok, I think I'm the only designer in America/world who did not get the antler fever. Just something about having that a part of an animal hanging around for such display that I couldn't get comfy with. dunno. call me late to the party, insane, call me whatever. but c'est la vie.